LRT, BRT, RT, TTC – There are already so many transit acronyms, why not add PRT to the list now. PRT stands for Personal Rapid Transit and it’s an old idea based on the idea of a private or semi-private public transit system. It’s not widespread, and no, it’s probably not an earth-moving mode of transit, but no doubt it’s interesting because of it’s peculiarity. 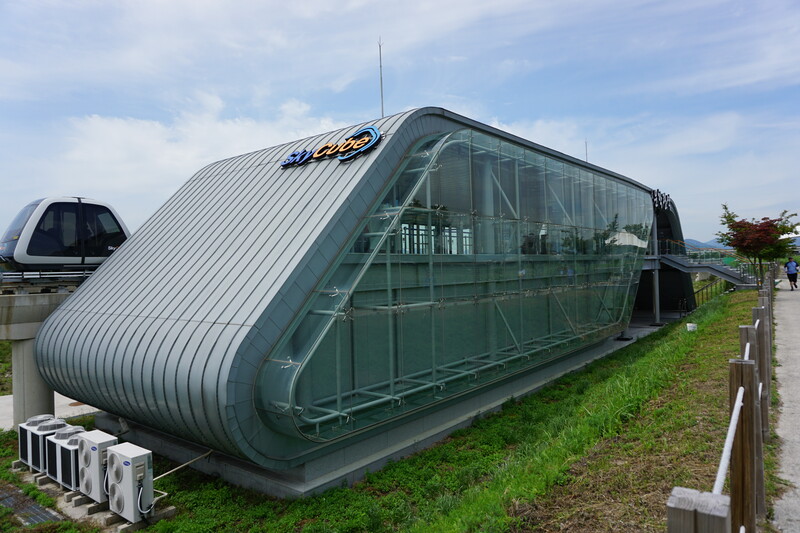 PRTs aren’t a new idea, but the SkyCube PRT in Suncheon, South Korea is the newest iteration of the concept. It was initially built for the an International Garden Expo and connects the park grounds to a famous wetland about 2.6 km away. Think of SkyCube as a subway line, except the subways are small (4-8 people) driverless ‘pods’ that zip you down an elevated track to your destination. Here’s a short video on the ‘Cube leaving the station. The pods travel about 50 km/h and offer extensive views of your surroundings, considering every side is made of glass. The sleek interior has two plush benches facing each other with TV screen depicting your location above. The ride was pleasant and quiet. In fact, it was a bit awkward with the other Korean family whom we shared a pod with. The entire experience of riding the SkyCube currently feels a little bit like going on an amusement park ride. It isn’t integrated into the rest of their transit network. You buy your ticket then get in line to go through a turnstile. Ticket checkers abound, and workers explain how to get in and operate the door buttons. I think this stems from it’s concept form. The SkyCube is a proof of concept – a vision of how transit could be in public-transit-oriented South Korea. Great read. A couple of weeks ago I’ve been in Suncheon and I rode the Skycube, too. It looks like there has been a long queue at the station for you? How did you have to wait? We waited about 5 minutes to get our ride. We shared it with a family of 3, too. http://videomapia.org/view.php?id=975 – video and synchronously map of SkyCube PRT.